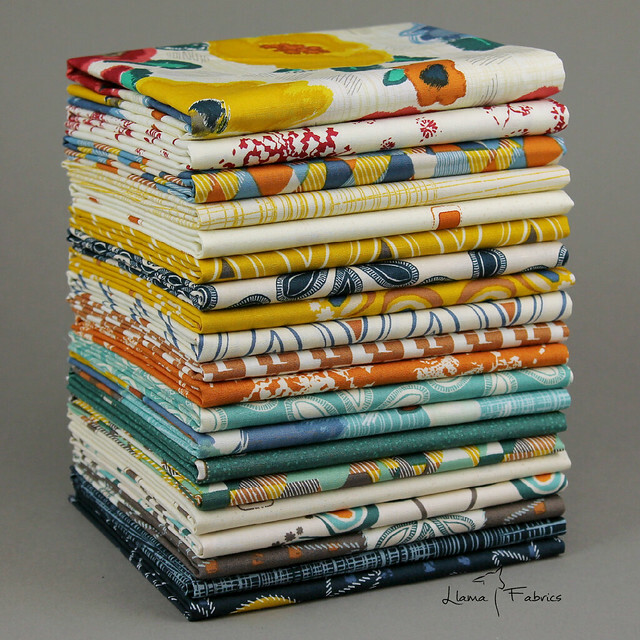 For this week's Fabric Giveaway Llama Fabrics is offering the ENTIRE Fat Eighth bundle of the brand new, beautiful Artisan collection by designer Pat Bravo for Art Gallery Fabrics! This bundle includes all TWENTY prints that make up this gorgeous collection! How amazing and generous!! That’s 4 possible entries! Enter now through Tuesday, September 8th! The winner will be picked next week at random and I will announce their name at the bottom of this post, here on the blog. This fabric is beautiful! Thanks for the chance to win! I also followed Llama Fabrics on Instagram. I pinned this post to Pinterest. Krisfmm Thank you!! I follow you on facebook! Thanks for the chances! What beautiful fabric! Thanks for the chance! Love this collection, especially the golds! Beautiful patterns! Thank you so much for a chance to win some! I follow you on facebook maureen! Congrats on the news of becoming the newest designer at Art Gallery!! I shared this lively contest on facebook! Thanks again! Love the collection so beautiful, thanks for the chance to win! I am following you both on Instagram! I follow you on Facbook also! We love llamas and fabric! I am also following llama fabrics on Instagram as well. I am following Llama Fabric on Instagram. I folllow Llamafabrics on face book as well. Thank you for the chance to win! I followed you and Llama Fabrics on Facebook and shared the giveaway. Facebook name is Erika Salazar. Thank you! This is so cool! Congrats, again, to becoming a full time collection designer! ArtGallery fabrics just keeps coming out with such beautiful collections . What beautiful fabric! Thanks for the chance to win. And, I'm a follower of yours on FB ! AND, I follow llama fabrics too! love these fabrics - the designs and colors! One of your happy followers via Blogger! Your sponsors always select the best fabric bundles! I love this collection, especially the florals! Beautiful fabrics! Lots of ideas floating around! I follow you through Facebook, congrats again on your latest success! I would love to win this fabric. It would be so fun to see what I could come up with or work it into. Email msmith7572@outlook.com. I love the fabrics. Thanks for the giveaway. I follow your blog and via IG. I follow you in Instagram and FB. I can't wait to see your fabric line! I follow MCH on Facebook. Love all the interesting fabrics and happenings. Email: msmith7572@outlook.com. Gorgeous bundle! Thanks so much for the chance ~ fingers crossed! What beautiful fabrics!! Awesome giveaway! Follow Llama fabrics on Instagram. I love your giveaways thank you!!!! I just now started following Llama Fabrics. Lovely! I follow you and love your blog. I followed Llama Fabrics on Facebook! This is gorgeous! A quilt would be in the works IMMEDIATELY. I'd like to win please! And I follow Llama Fabrics on Facebook now. Thanks for the great giveaway! I would love to use this fabric! 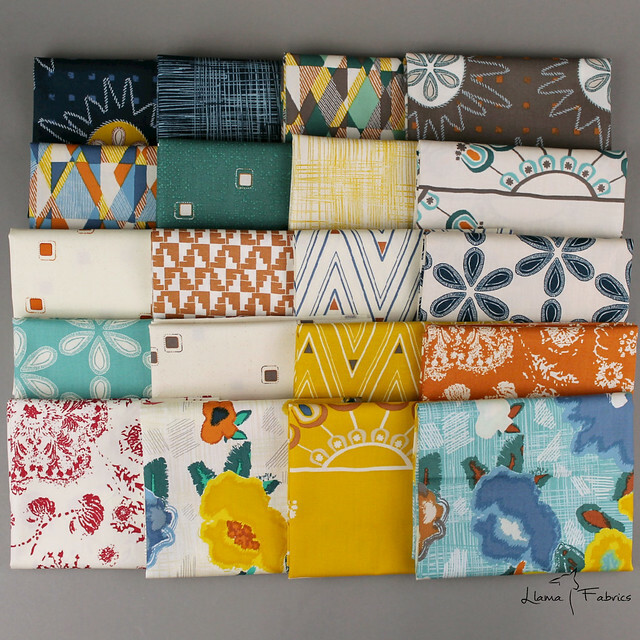 What a gorgeous group of fabrics! I tweeted about the giveaway also. Awesome fabrics. I would take good care of them. I follow Llamafabrics on FB as Kathy Newsom Davis. I would love to have this fabric. I have just the pattern for this beautiful collection! Thanks to you and you're fantastic sponsors for all these Friday giveaways!!!! Love those colors! Thanks for the giveaway! I follow you on fb ig and Bloglovin! I follow Llama fabrics on Facebook and Instagram! And follow Llama on FB, too! I have followed Llamafabrics on Facebook. ID Samantha Harvey. I also follow you on Facebook. :) How else did I hear about this giveaway? Maureen, I also follow you on Facebook! Not sure if you need our FB name to verify? The orange fabric jumped out at me.. I follow n facebook and Instagram. Thanks love the bundle. So pretty! A set of tote bags made from these would be great! Gorgeous fabrics! Thanks for the chance to win! Beautiful fabric. It would make a great quilt. I was just looking at this yesterday. It sure is a lovely bundle. I have some fabrics in my stash that would really accent this and make a great quilt. Very cute fabrics! I especially like the florals. I follow you via blogger, darling. This fabric is stunning! Thanks so much for this opportunity! Astonishing fabric! I love it! I like Llama Fabrics on Facebook. Following Llama Fabrics on Facebook! I follow MCH on Bloglovin, Facebook, and Pinterest. Love Pat Bravo and AGF just FEEL so good. Would love to win and share with my quilting group. We are trying to get started up and new bright fabrics would be a blessing. I love the autumnal range of colors in these fabrics! I follow Llama fabrics in face book. Love this unique color palette. I follow you on Facebook and IG (@smgajus). So pretty! Congrats on the Art Gallery Gig! What a choice of fabrics!! Fantastic!! So I follow you and Llama on Facebook, hope to win never wanes ! Oh, gracious. This takes my breath away. I'm following Llama Fabrics on Insta! I love the whole bundle! Following Llama Fabric on FB to win!! Following Maureen on FB to win too! !